Full 3 Row Seat Cover Combo Set with 3 Row Floor Mats. Universal application fits almost all 3 Row seats ( SUV and Van ). International Orders. Rear seat cover designed to accommodate 50/50, 40/60, 60/40, and 40/20/40 split benches. Fold your rear backrest down, seat up, or move back or forward. Faux Leather w. perforationHighest grade faux leather with center perforation and added strip design. Front Bucket Seat Covers Combo with Dash Grip Mat. Super easy installation, simply put the covers on and they will stay in place. Sideless design allows integrated airbag compatibility. International Orders. Complete Interior Combo Set includes: Two Airbag Compatible Front Bukcet Seats Covers, Rear Split Bench Cover, Headrest Covers with All Weather Rubber Floor Mats. Universal application fits almost all seats ( Cars, Trucks, Vans, & SUV ). Silicone products approved by FDA, SGS and LFGB. Non-toxic, odorless, and eco-friendly. Promotes healthy living. It will remain intact during any harsh weather, whether temperatures are from -40 to 446 degree Fahrenheit. Will Not Fit With Factory Fitted Armrest Located On The Driver Seat (need to be removed in order to use this one). 1ⅹArmrest with leatherette Padding. The top cover can be slided forward and rotated towards left direction, give better support to the arm. Back of bucket covers made of durable stretchy fabric with pocket for easy storage. This product is compatible with removable and non-removable headrests. Engineered to accommodate traditional and heated seats. Seat Covers Full Set Mint w. Steering Cover. Belt Pads. Black Carpet Mats. Full Interior seat covers set With Steering Wheel Cover, Belt Pads and Carpet Floor Mats Combo. Rear seat cover designed to accommodate 50/50, 40/60, 60/40, and 40/20/40 split benches. Complete Interior Combo Set includes: Two Airbag Compatible Front Bukcet Seats Covers, Rear Split Bench Cover, Headrest Covers with All Weather Rubber Floor Mats. International Orders. Material: Polyester with bold panels design. International Orders. Universal application fits almost all seats ( Cars, Trucks, Vans, & SUV ). Complete Full Car Interiror Seat Covers Set with Free Air Freshener. International Orders. DODGE GRAND CARAVAN 2012-2014. S.LEATHER SEAT COVERS. Complete Seat Covers Set for 7 Seaters 3 Row SUV VAN. 7 seaters fabric. 8 seaters fabric. Full Set 3 Row Leather Seat Cover Set. 3 Row seat covers. Leather seat Covers. Fabric seat covers. 3 row leather Acc. Rear: bench bacAest and bottom covers both have three zippers on them to accommodate left and right and 50/50 splits. An extra set of zippered cloth is included to cover the exposed rear bench area when split. Full Set Seat Covers Blue w. Steering Cover. Belt Pads. Black Carpet Mats. Full Interior seat covers set With Steering Wheel Cover, Belt Pads and Carpet Floor Mats Combo. Rear seat cover designed to accommodate 50/50, 40/60, 60/40, and 40/20/40 split benches. 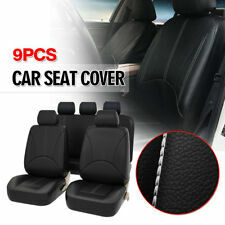 Complete 3 Row Full Seat Covers Set for Car SUV Van Truck. Protects your seat armrest. International Orders. Color: Black with Dodge Logo. Include 3: 1 Steering Wheel Cover. Include 1: 4pc Set Rubber Floor Mats. Heavy Duty Rubber Floor Mats. Include 2: 2 Front Seat Covers. 1 Universal fit steering wheel cover. Material is washable and breathable. International Orders.